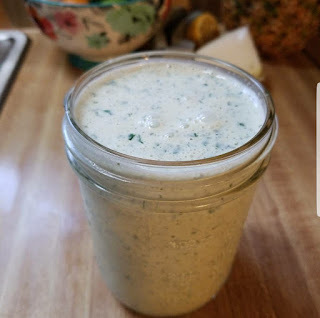 This is an FMD version of the creamy jalapeno dip that Chuy's serves. I have asked for their recipe and got a couple different versions, so I made up my own. Super good on tacos or on taco salad. Or as a dip for veggies! Keeps for about 3 days in the fridge. I would not freeze this. Portions are the same as dressings, in the FMD portion chart. Place cilantro, lime juice, garlic clove, and jalapeno in blender or food processor and run until finely chopped. Add remaining ingredients and pulse to blend. Let sit for an hour or so before eating. Taste and adjust salt or pepper. If it is too thick, add almond milk, a tablespoon at a time. What can I use as the base besides Mayo? I have never liked it, even homemade. Is there an alternative? This is basically a jalapeno ranch dressing. There's no other base to ranch besides mayo. This, like ranch, doesn't taste anything like mayo. How do you make your own mayo? Our local Chuy's told us the secret to the jalapeno ranch is tomatillos! I don't know if that was in any of the recipes you received in your research or not. Love Chuy's Jalapeno Ranch and this looks just as amazing! Which of your mayo recipes (with egg or vegan recipe) do you recommend for this recipe?